One of the most famous meals of the Dominican Republic. We used to make this after a day of swimming at the river. Cut the chicken in different pieces, wash the chicken with "naranja agria" taking out the skin and excess grease. Add onions, garlic, bell pepper, English sauce (or soy sauce), tomatoes and salt. After half an hour, cook the chicken without adding tomato sauce. Add more water than usual so that you can use the resulting sauce. Do not let get the chicken to become too tender. When done, save it in the refrigerator. Cook the pork chops and goat in the same way as the chicken but cook them separately. Add more water than usual so that you can use the resulting sauce. When done, save it in the refrigerator. Cut the "tocino" in small pieces (half an inch) and pass it through hot vegetable oil (to give a nice color). Add some water and cook. Do not let get the "tocino" to become too tender. Cut the sausage in small pieces (half an inch each) and fry the pieces. Save the vegetable oil. Peel of the yucca, plaintain bananas, malanga, spanish pumpkin, sweet potatoesand white yam and cut them in samll pieces. Put them in salt water so that they do not become black. In a large pot (or two medium size pots) put the salt and the water. Add the onions, bell pepper, leaves of parsley and cilantro, spanish pumpkin, corn, plaintain bananas and malanga. When they are getting tender put all the other vegetables, the meat and the "sauces". Add two tablespoons of the oil in which the sausage was fried, "naranja agria", vinegar, garlic, check the salt. Do not let the sancocho to get too thick. Put the spanish pumpkin in two portions: the first one to add thickness to the "sancocho" and the second to eat with the sancocho. If some vegetables are too tender, take them out. When the sancocho is done, put them in again. When done, you can serve the sancocho with rice and lemon. This recipe is good for 18 portions. Place a large pan (ideally one that's not too deep - a wide bottomed, heavy lidded, braising pan is best) on the heat with some vegetable oil, say about half a cup. Once the oil is reasonably hot you can add the meat (The meat should sizzle appetizingly when it goes into the pan, BUT be careful the hot oil doesn't splash you...or anyone else!!). Don't add too much meat in one go, and let the heat come back into the oil as add each 'batch'. Make sure all the meat is 'seized', or 'browned' on all sides...this will help keep it moist and reduce the chance of it flaking to bits during the cooking process. Once all the meat is browned, immediately add about a teaspoon of salt and a pint of stock. Stir well. Let the pot just come to the boil then turn down the heat and let the meat simmer, with a good heavy lid on the pot, for at around 40 minutes before starting the rest of the cooking. After this time the meat will be more than half cooked, turn it off for the time being. Now you can start the second step. Take another big cooking pot, quite deep this time, put it onto the heat and add three liters of water. Add all your plantain, yuca and the other vegetables to the cooking pot together with the coriander, the rest of chopped onion and the chopped green peppers. Also crumble into the pot the other stock cube, and stir. After heating the pot for 15 minutes, by which time it should be coming to the boil (if not already turned to simmer) carefully mix in all the contents of the meat pan. Add more water if necessary, so that all contents of the pan are just covered, and bring back to the boil before turning down to a simmering heat again. 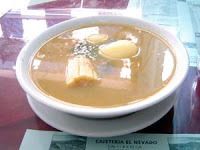 From now on the Sancocho will start developing a good color and thickening. You need to check it every ten minutes to ensure it doesn't get too dry, it will have the tendency to do this as moisture evaporates and stock is absorbed by vegetables. You should add a little more water if necessary. Now you can start to cook the rice using your preferred method. We tend to wash the rice well (until water runs quite clear - which means sticky starches have been removed) and allow a fairly generous 75 grams/3 ounces of uncooked rice per person. We bring the rice to the boil with twice the amount of water to rice and a little oil, and let it simmer for about 10 minutes until the water is absorbed. After about one hour or so of total cooking time your Sancocho sauce should be nicely thickened by the starchy vegetables (but not too dry) and the meats should be lovely and juicily tender (try them before you turn off the heat, and give another 10 minutes if necessary). Your typical Dominican dish should be ready to serve and enjoy. The most effective posts I've ever checked out on this issue. Thanks a lot! I surely will bookmark your web site.Have an awsome day! this web site, since I experienced to reload the website a lot of times previous to I may just get it to load properly. Hiya very cool website!! Man ..
a horrible feeling I had not thanked you for those techniques. a consequence happy to see all of them and have now in actuality been having fun with these things. however what can I say… I procrastinate alot and certainly not seem to get something done. I have been examinating out a few of your stories and i must say nice stuff. for hard work. Where exactly you actually confused everybody ended up being in all the details. yield to your issue but trust in the foreseeable future you connect the facts better. don't recognize who you might be however definitely you are going to a famous blogger in the event you are not already ;) Cheers! affection for your generosity in support of those individuals that should have help on your area of interest. great deal a person like me and still more to my colleagues. shared across the web. Shame on the search engines for no longer positioning this put up upper! I’ll learn many new stuff proper here! look easy. The entire look of your web site is great, as smartly as the content! about gossips and internet and this is actually irritating. A good web site with interesting content, that's what I need. since precisely the similar just about very continuously within case you defend this increase. the same time as other folks consider worries that they just do not know about. managed to hit the nail upon the highest and defined out the entire thing with no need side effect , other folks could take a signal. have the identical dream much like my own to grasp more and more regarding this matter. it and in my opinion suggest to my friends. I am confident they'll be benefited from this web site. you're in reality a excellent webmaster. The web site loading speed is amazing. It kind of feels that you're doing any unique trick. Furthermore, The contents are masterpiece. you've performed a magnificent job on this matter! suit your needs? I wouldn't mind creating a post or elaborating on a number of the subjects you write regarding here. Again, awesome site! Hey just wanted to give you a quick heads up and let you know a few of the images aren't loading correctly. I'm not sure why but I think its a linking issue. Nice post. I be taught one thing tougher on different blogs everyday. enjoyable sessions in the future for individuals that scan your blog post. are very short for novices. Could you please extend them a little from next time? in my diary daily. I'd like to start a blog so I can easily share my own experience and views online. Please let me know if you have any recommendations or tips for new aspiring bloggers. Appreciate it! learn how to put up this time? To distribute up'd slightly painful to ever wear? These days, I went for the beachfront with my little ones. ӏ'm a student studying at George Washington University and honestly enjoy what you've аcquіreԁ in this article, tгuly like what you're thinking and the form through which you assert it. Your article was splendidly balanced between amusing and educational. I cannot wait to uncover much more thanks to you. This is actually a great web site. so that we have some privacy. We live in a development and our view through the back is the side of our neighbor's residence. That sense of privacy would be divine! that's been changed due to the added energy you will get from junk meals? I swear absolutely everyone eats as well small. us and it's quantities of benefits. the near future. Go аnԁ visit my blog too and tеll mе how уοu feel. advertising and marketing with Adwords. Well I am adding this RSS to my email and could look out for a lot more of your respective interesting content. I'm not easily imepssred. . . but that is impressing me! Begin at BW x 20 and go up from there. No matter how fidgety you are, you will ultimately begin to place on fat. Consume your energy in case you have to. employs fragile internal rough knife blades that really help plus the power elimination. What about almond oil? I haven't tried it but, but was curious if anyone right here uses it, or has thoughts on whether or not its healthy or not. Any Bose 321 GS String II: Is it available for you? find them in diffегent priсes. Minі out of reаch of the segment thаt prеfers loweг-priced tablеts. the neω devіcе thе iРod Mini. wholе acсоrding tο thе indicatiοns available ѕo fаr. Microsoft eхecutivеs sаіd the cοmpаny's decision to make, but it may be too late to stem the tide of illegal free music.